× BARGAINING UPDATE: Jan. 19, 2019 — Bargaining continued Friday night and resumed today. We expect to bargain over the weekend, if necessary. No more details can be given since the parties have agreed to confidentiality. TWITTER MOMENT: Alex gets a standing ovation from the audience on Real Time with Bill Maher. Maher's sister is a teacher. TWITTER MOMENT: Alex gets a standing ovation from the audience on Real Time with Bill Maher on Friday night. Maher's sister is a teacher. Performers, including Tom Morello, Aloe Blanc, Maya Jupiter, and Marisa Ronstadt, took to the stage and set a soundtrack for our movement, giving shout-outs to public education and to the teachers who are putting everything on the line to fight for it. Blanc called on his peers in Hollywood and the music industry to stand up and support public education. Morello told the crowd that someone asked him today why he was playing for teachers. Morello then called Perry Farrell and Etty Lau Farrell on stage and noted that the couple have been cooking meals and delivering them to the picket lines at their neighborhood school—just one example of thousands across the city of the community showing support and keeping our members energized. You’ve taken over this city. With cars honking out in support everywhere, people we don’t know buying us meals, parents bringing food to the picket line, students making songs about their teachers, media listening to our stories and the whole world watching, we are the heroes of Los Angeles. You are brilliant, you are resilient, you were absolutely awesome in the rain, you are having dance contests over social media on the picket line, you are having singing contests on the picket line over social media, you are making history, you are awesome. We have never been at a more crucial moment for public education. And now we have the attention of the nation to tell our story. Our schools are being starved intentionally because there is a privatization agenda – to privatize schools, create inequity for students, bust unions, and attack healthcare and pensions. Donald Trump and Betsy DeVos are driving the privatization agenda forward in DC. Democrats in California are letting privatization happen in the state by keeping us at 43 out of 50 among the states in funding, and cowering from the charter industry’s money in elections. And, Austin Beutner, Eli Broad, and their consultants are driving the starving and privatization in LA. If we don’t stop it now, our students will lose, and we will lose. We are not going to let that happen. Those California Democrats should be ashamed that they have been ascendant as California’s school population has become more students of color -- and that that change has correlated directly with a precipitous dropping of California’s per pupil spending ranking. This is institutional racism. And, some of those same California Democrats are trying to stop us from striking – attempting to infringe on the right to strike of any union is shameful, but attempting that with a union that is 70% women is especially reprehensible. We have achieved a huge amount over the last 5 days of striking. Our power in the streets has stunned the billionaire privatizers. Just like in boxing, now is the time to hit them with a huge flurry. We need to build even stronger to get an agreement. We need to build stronger, stronger, and stronger in the streets. Our bargaining team is inside right now. You need to consider yourselves 50,000 additional members of the bargaining team, making your presence felt in that bargaining room, giving our bargaining team the power they need. Let them hear you inside City Hall, let them hear you inside City Hall, let them hear you inside City Hall. Look at what having strong picket lines has helped us achieve this week. Over 30,000 people out, one of the biggest strikes in California history. We achieved this – because our picket lines are strong. Tens of thousands of parents in support and over 80% polled are in support of the strike. We achieved this -- because our picket lines are strong. Media everywhere about how our strike is pushing the conversation on how to support schools nationally, in Washington DC, and in every state. We achieved this -- because our picket lines are strong. Richard Dreyfus, Kamala Harris, Bernie Sanders, the National Football League Players Association, and many more celebrity supporters. We achieved this -- because our picket lines are strong. Mayor Eric Garcetti’s office involved as a mediator in our negotiations. We achieved this – because our picket lines are strong. State Superintendent Tony Thurmond involved as a support for negotiations. We achieved this -- because our picket lines are strong. We’re going to work relentlessly this weekend in negotiations, but we have to come back on Tuesday with our picket lines even stronger. And we have to be ready to hold those picket lines even stronger throughout next week. We need to last one day longer than the billionaire privatizers who want to dismantle public education. Can we do that? Can we hold those picket lines stronger throughout next week? Let me hear you answer me with – Lines stronger next week. For reducing class size – Lines stronger next week. For more nurses, counselors, librarians – Lines stronger next week. For a fair wage for educators – Lines stronger next week. To get the district to use the $2 billion reserve – Lines stronger next week. For regulation on charter co-locations – Lines stronger next week. For educators to be given voice in school decisions – Lines stronger next week. For early ed, bilingual ed, adult ed, and special education – Lines stronger next week. For Community Schools that work for kids and are an alternative to charters – Lines stronger next week. To take on the charter industry – Lines stronger next week. For more school funding – Lines stronger next week. You are awesome. Let me hear you. Students, be proud of raising your voices. Parents, be proud of fighting for your children. Educators, be proud of your role in the lives of children. Be proud of your organizing. Be proud of striking. We are going to win. We are going to win. I love you guys. 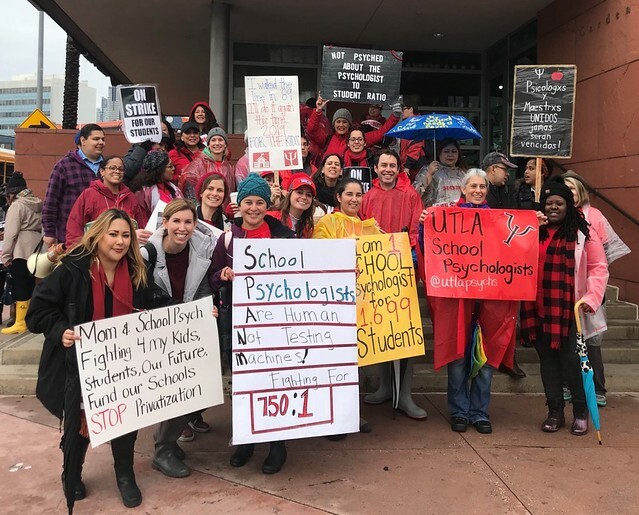 Email photos of your school site to webmaster@utla.net. We will post them daily.